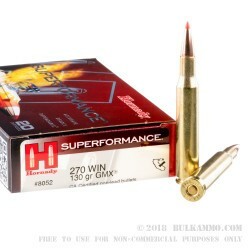 This 270 Win cartridge from Hornady’s Superformance line of ammunition features a 130 grain GMX projectile. 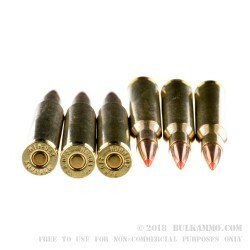 The bullet’s mono-metal copper alloy construction means that it shoots far more cleanly than lead, and also that it will not separate so it will retain 95 percent of its weight during penetration. 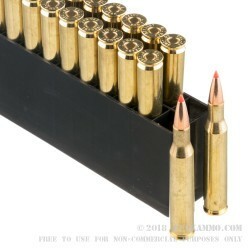 (Additionally, this bullet’s composition makes it fine for use in areas where toxic ammunition has been banned.) The GMX sports a polymer tip to streamline its shape and initiate expansion of up to 1.5 times the bullet’s original diameter, giving you the devastating terminal performance you need to take down game fast. The GMX also features a long and sleek profile which substantially lowers its drag in flight. The bullet’s crimping cannelure and pressure relieving grooves reduce both bearing surface and fouling, making it less harsh on your bore. 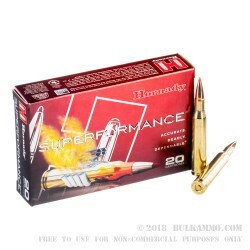 Its technologically advanced bullet along with its Boxer primed reloadable brass casing makes this round a great investment in your next hunting season.